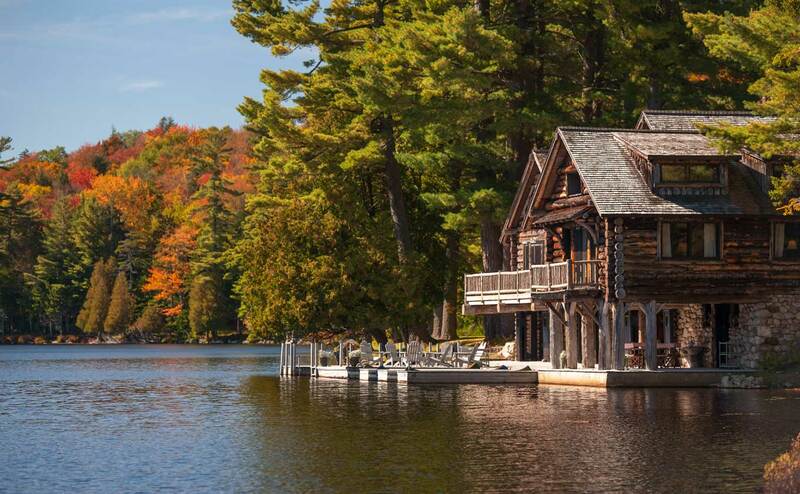 Set amid the spectacular New York Adirondacks, this historic Great Camp features charming luxury lodges set on a thousand-acre private wilderness escape. Luxury Lodges set on a thousand-acre private wilderness escape. Lake Kora is the pure distillation of summertime, of leaping off docks, of gleaming wooden boats plying the private lake and dinners by the grand fireplace. Once a private playground for the Vanderbilts, Lake Kora invites your family and friends to experience this extraordinary property as a Great Camp of your own for a rejuvenating few days, a week, or a month at a time. A full staffed and all-inclusive rustic paradise. Originally Lake Kora's library. The Library suite is located next to the Boathouses. Filled with light, the shoreside one-bedroom suite enjoys a stunning view over the lake. With a wooden exterior and traditional wood interior, it’s a sunlit sanctuary. The original structure on Lake Kora. The Island Cabin is only accessible via private electric boat. Here you will enjoy vistas across the lake, a private hot tub, lounge, dining and kitchen areas.